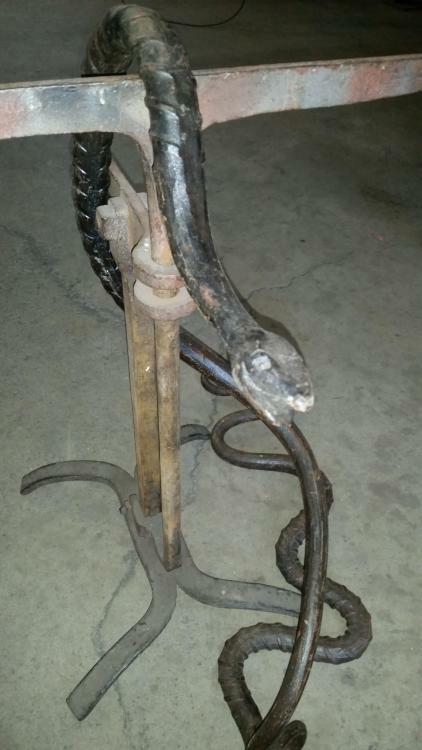 Rebar can be a pain, but it does make good snakes. I usually use threaded rod for these, as it is much easier to work and I hate drawing out tails in 1/2 inch rebar. But the rebar scales look good. Could we see some more snakes? Files? Stainless? Textured? Whatever? Can't recall if I have posted this before, but these are the usual threaded rod cobras. Much easier to work than rebar. My wife made this guy from an old rasp. Rasptle snakes---shake them right and they sound a lot like the "organic" ones; I can attest from experience! Nice rasp snakes, IF and TP. I have only tried that once - very tricky to keep the fold in the rasp straight. Finished up in the scrap. Naw you stick it in a vise and twist it in line with a pipe wrench...I also have several swages I use for doing the curve in, that seems to help me vs using the step on the anvil. 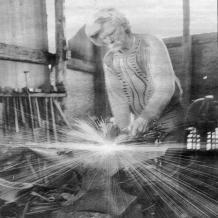 4. using a swage or the anvil step and a cross peen hammer star-t curving the body, coarse side out. 5. continue to work the body around using the swage to help the bottom curl while you are curling the top with a hammer. 8. Flatten the body a bit if you like. 9. open the post vise jaws several inches and slip the heated snake's head in under the back jaw and over the front jaw. Slip a large section of pipe over the tail and down to near the front vise jaw and use the pipe as a lever to bend the snake into a curve. Reheat the body as needed and flip the snake over and insert it till the previous bend locks under the back jaw and put the pipe on and bend the other way. Repeat as wanted. Flatten/adjust with a wooden or rawhide mallet. 10. punch the facial features. 11. bend tail up; let cool slowly and smooth the tail a bit if needed. I punch the bottle caps with a flat bottomed punch on end grain scrap wood, they should fit loosely on the tail. Leaving room for them to move when shaken bend over the tip of the tail to hold them in place. 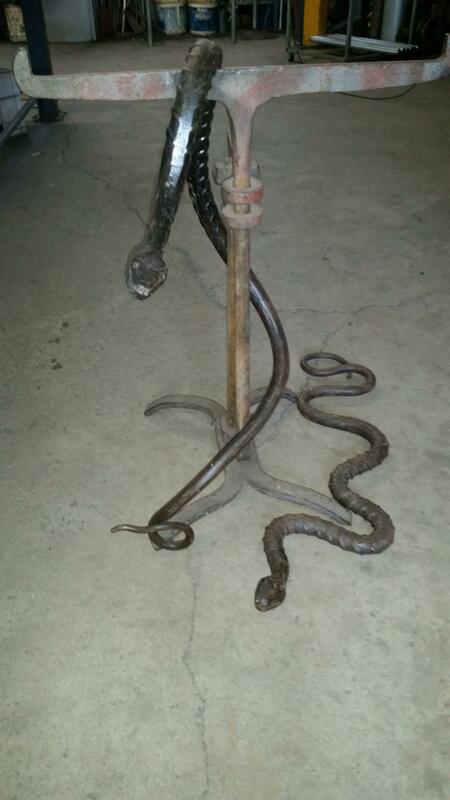 A couple of the snakes I have found in my shop. Found a couple of long 1/2 wrought iron bolts. 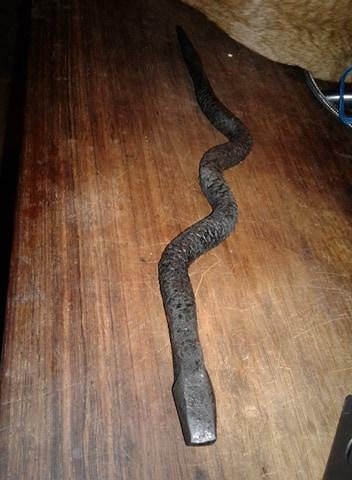 I always have difficulty with wrought so thought it would be a challenge to forge a snake. Kept it really hot and managed OK with only a minimal amount of delaminating (Pic 1. I thought it may have been a fluke so forged a second one and it went well. 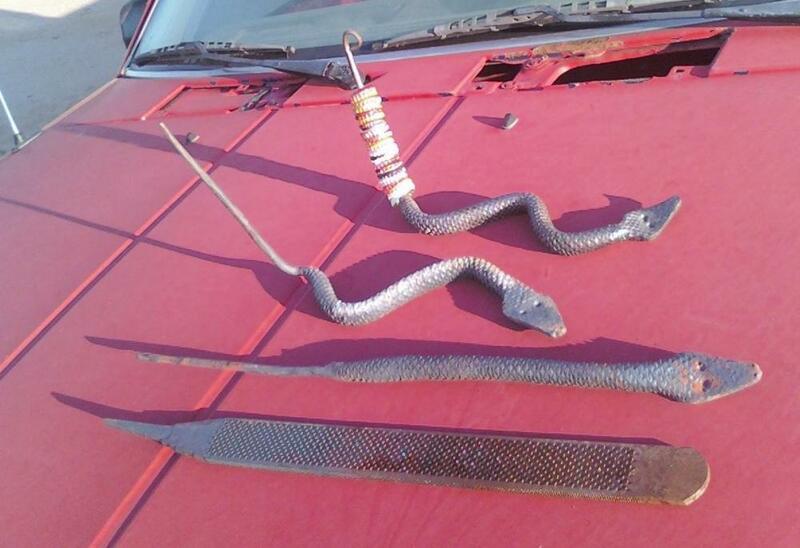 So the real challenge was to forge a cobra without splitting open the hood. I wrecked one but the second go was OK. Wet season here so very few visitors to the forge - a chance to use demo time to try things that are not guaranteed to work! Nice snakes Aus. I've only messed with WI a couple times and its a real challenge to remember how hot it has to be to successfully forge. The upside is when it starts to delam it welds back together fairly easily. My first go was a carving fork and one of the tine ends literally splintered at a medium orange heat. It welded back together easily enough but I had to work fork tines at sparking heat! They were smaller than wire, pitch fork times. They split out from the main body easily but HOLY MOLY it was A PITA! Fork turned out nice enough and served nicely to carve the roast pig, another attendee at the Shindig forged the carving knife from a spring. In less than half the time start to finish! 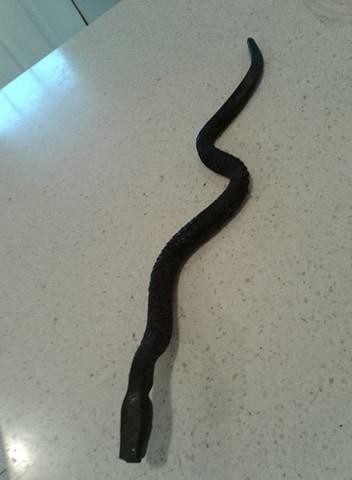 Nice snakes Aus, I feel your PITAedness Brother. I have no trouble with that: heat the entire snake to forging temp. Put it on my large anvil. Put a piece of 2"x6" over it and SMACK it with a sledge hammer---or else do the same with my screw press. Or heat it up and using a rawhide mallet go over it truing to the anvil face. Curled ones I can use a "bolster plate" and flatten to that with the head going through the hole. Yes, they must sit level. 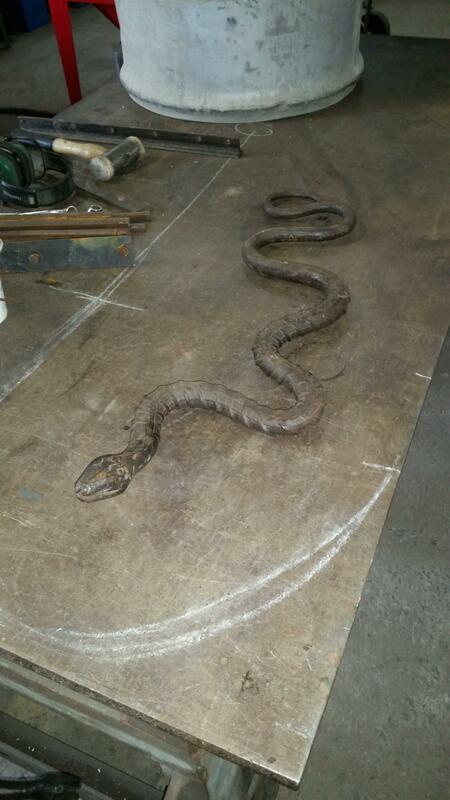 My work anvil is not perfectly flat so I set the hot snake on a heavy flat length of timber and tap it level. Nice snakes. I like the cobra. How do you get the hood like that? And I always punch the eyes before forming the hood. Much easier that way. 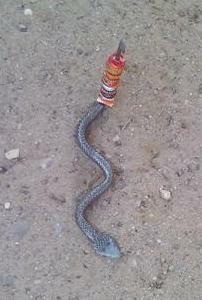 Practise widening a piece of scrap bar before you forge a snake. Thank you Ausfire. There is a busted cable spool at work that has four three foot long bolts on it that my boss said i can have. I have been trying to think of what I could do with that.... and those snakes look like they could definitely be the ticket!! Yep, great snake material. Looking forward to the photos, Ben. PS. I like your dog. Is that a Sheltie?? It is indeed. Iria is her name. She's my bud . A couple of snakes I made a while ago when I was given some 32mm rebar. both are about 1500mm long and I made the flat one first as a "what can I do with this exercise". The wearable one was made next because my son wanted something he could wander around with and scare people. He (the snake) has had his picture taken with lots of people since.